With the spring season change upon us, we know that weather isn’t the only thing that changes during this time of year – students do as well. If students change, then we as teachers should also implement changes. There should be some practices that are distinctively different second semester than the first, and one of them is how you do your morning sign in. 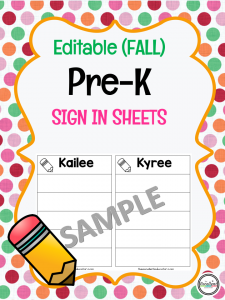 Sign in sheets are a widely-used practice in early elementary grades. There are many benefits to implementing them when used daily for young children. 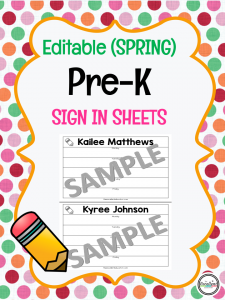 They assist with establishing morning routines, provide a way to track attendance and serve as documentation for name writing growth. 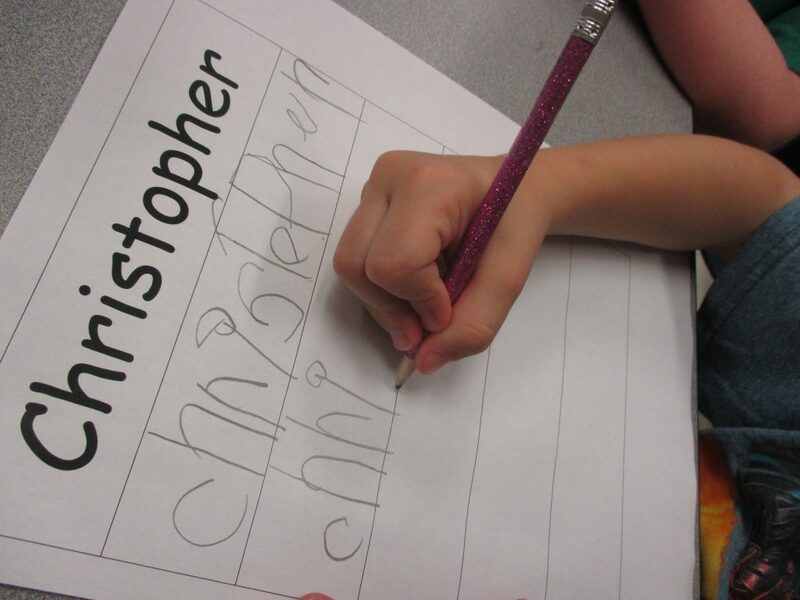 Children get the hang of signing by the first month and adopt it as their normal morning duty. My students actually loved it! I used the one page sign in and I had a small area established in my room. I also set the expectation at the beginning of the year that there could only be three people at the sign in table at a time. (This prevented the whole class from standing in line, which would be chaos waiting to happen!) When my students came through the classroom door and greeted the class, they got their homework folder out, placed it in the crate, hung up their book bag, signed in (first name), then went to their assigned table. If there were three people at the sign in table already, they went to their seat and participated in the morning work until the they were able to sign in. Once my students got the hang of this, we continued it for the entire first semester and for half of the second semester. 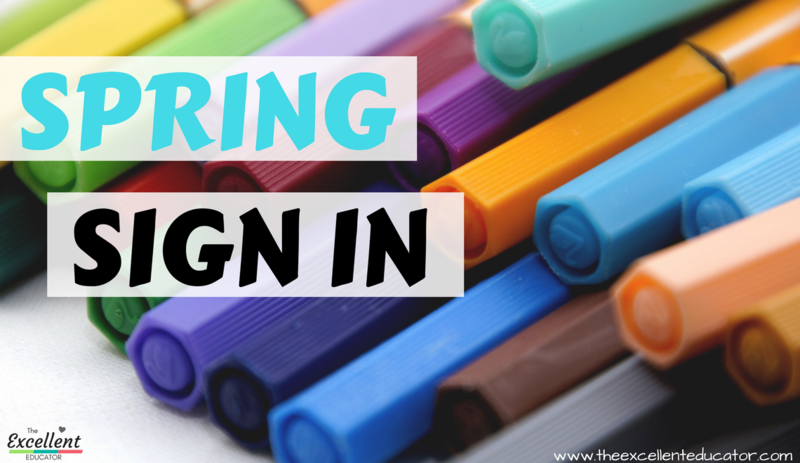 During the spring as I noticed large amounts of growth and proficiency in my children following directions and being able to do more complex tasks, I decided to change some things up! The sign in procedure was one of them. The first minor change was having my children sign their first and last name. I also added an additional task to collect data and add some math and community building at the same time. March was when I did a large group lesson to introduce the idea of having a preference. I explained to my students that when you prefer something, it means you like it more than something else or that you like something the most, out of other choices you have. I read Gregory the Terrible Eater with them and talked about how Gregory was very picky and he preferred some food over others. I gave them the example using two fruits: red grapes and green grapes. I told them how I prefer red grapes over green grapes. I had grapes washed and prepared for us to do a taste test, so they could also decide on their own preference. I was sure to explain that there are times when you may not like either of the two choices and if that happens, it means you don’t prefer either. After the taste test, I sorted the class into three groups in the room. The first group consisted of the children who preferred red grapes, the other group had the children who preferred the green grapes and the final group had children who didn’t prefer either. We counted and discussed the numbers within the groups to see which had the most and which group had the least. 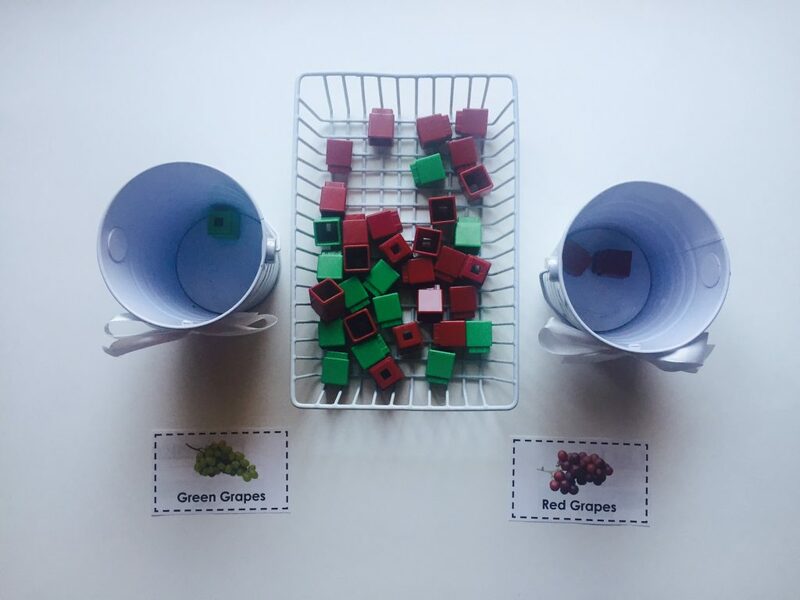 I provided a bowl of mixed unifix cubes and two bowls that were labeled “green grapes” and “red grapes” so the children could pick a unifix cube that matches their grape preference and drop it in the corresponding bowl. 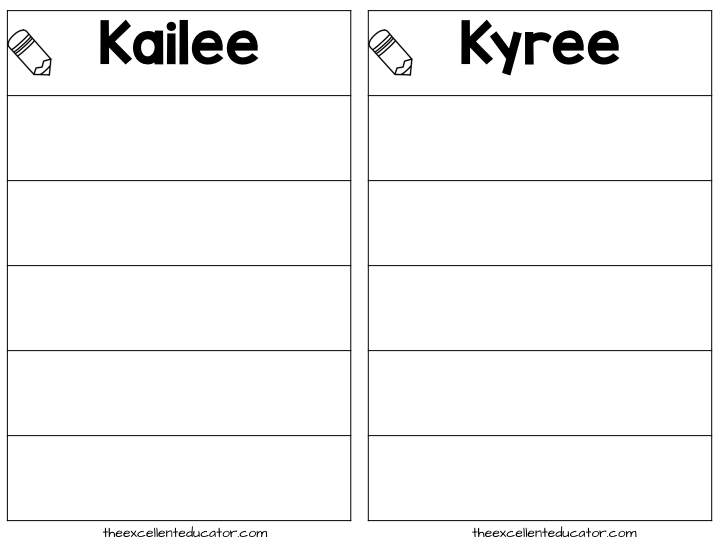 I showed them how a preference choice would be a part of our new Friday sign in procedure but it would be introduced on Thursday, so they would know their options and how choose. 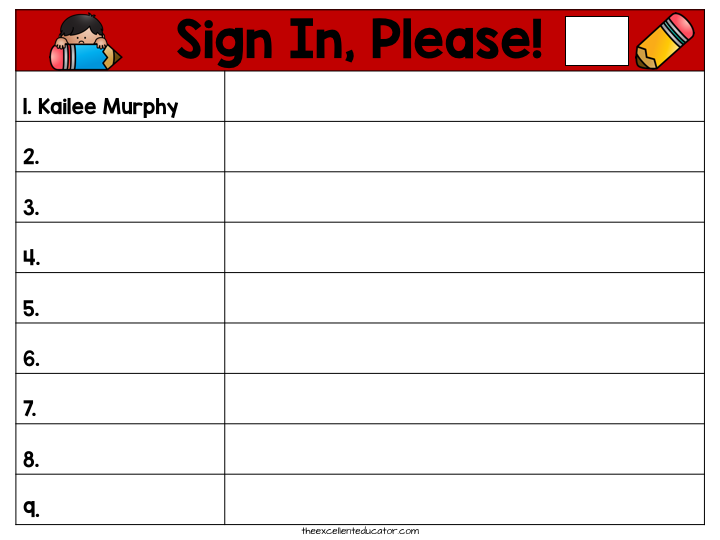 Instead of using the regular sign in method, they would sign their name and then make a choice about their preference. During our morning calendar time, I collected the preference data and we discussed it as we started our day! We got to learn a lot about each other’s preferences even beyond food. Here is a list with some of the preferences that I used, to get you started. 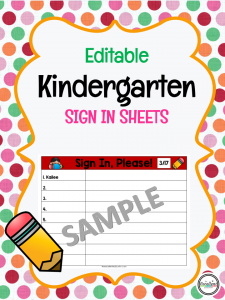 If you are a teacher in older grades, you can try incorporating a daily sign in sheet using the same concept, but have children to sign on the area below their preference. This is also a good way to incorporate a variation to the question of the day/week you may be doing. No matter what age group you teach, you can use this very idea so many different ways. Be creative and think about how the idea will work for you! If you have any questions or have something share, I’d love to hear from you, so please leave a comment or email me…I’ll be waiting! This is a excellent way to bring excitement to the class. Even adults like some type of change. It breaks the usual mundane. Continue keeping us on our toes Ms. Hill. Thanks Bruce! It’s always a pleasure to share and know the content is relevant. Thanks for taking time to read the post and leave feedback!